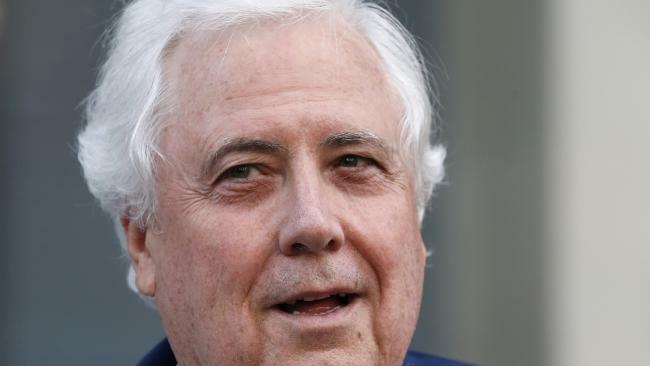 EMBATTLED businessman Clive Palmer announced plans to restart his self-titled political party, while the corporate watchdog investigating his former business activities. This is despite the party being voluntarily deregistered last year and his ongoing court battles over his former company Queensland Nickel going into liquidation owing about $300 million and leaving about 800 workers out of work. He would have to find 500 members signed up to the party to be able to register it again with the Australian Electoral Commission, or find an existing Federal MP or Senator to sign up to the party. In a statement this morning Mr Palmer stated he intended to restart the party to contest the next election, but did not say if he would be a candidate himself. "Since I left Parliament I have experienced the frustration and helplessness that all Australians experience with the major political parties," he said in a statement. "It's time for Australia to reset its agenda for economic growth and prosperity." Clive Palmer said his party aims to reset the “agenda for economic growth and prosperity”. The Palmer United Party contested the 2016 Federal election, but received just 26,210 votes or 0.19 per cent of the national vote in the Senate. It received just 4816 votes or 0.18 per cent of the Senate vote in Queensland. The Townsville-based seat of Herbert was the only lower house seat to party contested. Mr Palmer's nephew Martin Brewster was the candidate and received just 315 votes, or 0.36 per cent of the vote. Last week Australian Securities and Investments Commission boss John Price told a parliamentary committee that their investigation into Mr Palmer's companies included "suspected breaches of directors' duties provisions and also various provisions of the Corporations Act to do with false documents". "It is looking at a wide range of potential actions, administrative, civil and possibly criminal and the time-frame will depend on the best path," he said. "It's looking at the directors and officers of the group of companies beneficially owned by Mr Palmer, including Mineralogy Pty Ltd and Queensland Nickel. "Turnbull and Shorten don't care about our future generation and seek to deprive rather than provide opportunities for young Australians. "The Palmer United Party will contest every seat in the House of Representatives and Senate in every state of Australia. "We need to expand our economy and provide growth for all Australians." He said ASIC had issued more than 120 notices for the compulsory production of documents, questioned more than 30 witnesses, received and processed almost eight terabytes of data, were currently undertaking detailed analysis more than 37,000 documents. The Palmer United Party was swept into Federal Parliament in the 2013 election, winning three Senate spots and Mr Palmer himself was elected to the Queensland seat of Fairfax. Before the term was up two Senators had resigned from the party, former footballer Glenn Lazarus and Jacqui Lambie. Mr Palmer did not recontest his seat, while he announced he would "retire" from politics shortly afterwards.